Hamlet’s Castle conjures up images of intrigue and dark deeds in vast medieval halls overlooked by menacing stone battlements. Hamlet’s Castle conjures up images of intrigue and dark deeds in vast medieval halls overlooked by menacing stone battlements. Whether the reality matches the fancy I don’t yet know, but I have the chance to find out by visiting the home of the Danish prince in Elsinore. Shakespeare’s drama of suspicion, guilt and revenge has always been a favourite of mine. Old towns, colourful villages and rocky coastlines dot this corner of Scandinavia. We’re staying in the university town of Lund in Sweden. Helsingør, to give Hamlet’s town its proper name, is of course in Denmark, and about fifty kilometres away. The town and its castle guard the northern entrance to the Øresund, the long, narrow stretch of sea between the two countries. My husband John just wants to go on the train ride. At Lund railway station I discover a 'Round-the-Øresund' train ticket that lasts for two days. One ticket allows us to take any trains on the route through the two countries, stopping off as and when we want, as long as we complete a circular tour of the Sound. We have only one day to complete the trip. Lund is Sweden’s oldest university town - 'Sweden’s Oxford' - built around Scandinavia’s largest university. We’ve been here for a few days and although the town does not have the dreaming spires and imposing quadrangles of Oxford, it is alive with students pushing their bikes across spacious, tree-filled squares and bumping over the cobbles in narrow streets. Sturdy houses of dark stone jostle with winding merchants’ lanes and elegant pseudo-classical university buildings. Modern shops and restaurants sit snugly among them. Lund is an eclectic and easy mix of old and new. At the Expresso House I can drink my morning coffee from a tall glass while sitting at a high chrome table overlooked by bright abstract paintings. Around the corner in Conditori Lundagard, surrounded by chintz and sketches from a bygone Lund, my coffee comes in a delicate flowered china cup and saucer. I feel comfortable in both places. Among several galleries and museums, I’m entranced by the Skissernas Museum (Museum of Sketches), a collection of artists’ first drafts that is housed in a barn which looks more like the storeroom of some eccentric collector. I clamber through the piled up works of famous painters and sculptors to reach yet more exhibits, some in back rooms and on balconies. The museum is about to close for renovation; I hope that it doesn’t lose the atmosphere of an accidental collection. The squat cathedral, or Domkyrkan, dates from the twelfth century and reflects the town’s history. In one corner, carvings of knights, angels and signs of the zodiac surround the intricate dials of the astronomical clock that was originally constructed in the fifteenth century. I’m the entire audience for the guided tour. Nevertheless I get the full treatment, in English. Later, struggling with a town map, I stop a middle-aged woman pushing a bike and politely ask her, “Do you speak English?” She looks at me as if I am off my head. “Of course I speak English!” she exclaims, clearly offended. Our train journey starts before dawn and it’s a struggle to get out of bed as we’ve spent the previous evening helping a young academic from the University celebrate the award of her doctorate. But the late autumn days are short and we want to complete most of our trip in the daylight. Our first destination is Helsingborg, the Swedish port which faces Helsingør across the mouth of the Øresund. The slow progress north, with frequent stops, suits us well. As the sun rises, the train ambles through placid green fields, rolling hills and pine woods, past farms and villages of brightly-painted wooden houses. In Helsingborg we leave the railway station in a biting wind. The iron grey of the sky and sea is reflected in the rain-soaked roads and buildings. This is a busy working port and it will take only twenty minutes to reach Helsingør across the choppy sea. There are several ferry lines, and a flotilla of boats plies back and forth between the Swedish and Danish towns. Ocean-going container ships line the harbour and the remains of a fortified medieval castle on a hill glower across the sea to Denmark. After a warming coffee and a quick walk through the busy town centre, we go for the next ferry. Sure enough, when we reach Helsingør and step off the boat, the quayside is packed with opportunistic Danish traders and their Swedish customers stacking crates full of beer bottles onto the trolleys. We decline several offers of cheap booze and push our way through to the town. Our first sight of Hamlet’s castle was when it loomed out of the mist as we neared the Danish shore. It's sited on a promontory jutting into the sea and dominating the harbour entrance. With massive outer walls and fairy-tale turrets, it’s the perfect setting for ancient royals locked in deadly power struggles. Hamlet’s castle, I discover, is in fact Kronborg Castle (or 'Slot'), for centuries a residence of the kings and queens of Denmark. More palace than castle, it has a prominent place in Denmark’s history. There is understandably a somewhat peevish note to the tourist literature that points this out, while acknowledging that for much of the world it is merely the castle where Shakespeare set one of his most famous plays. Surrounded by the sea and the mist, the visitor can explore apartments restored to their seventeenth-century splendour of wood-panelled rooms, vast marble fireplaces and elaborate tapestries. The royal rooms overlook courtyards where kitchens, servants quarters and dungeons are to be found below. A huge hall with recessed windows looking out to sea could so easily be the scene of Hamlet’s dramas. The art gallery and scars of ancient battles add to the atmosphere of a one-time city state. All is beautifully preserved and presented, and I could spend days here. John has to admit that he has also enjoyed seeing around it. There is even a slightly grudging Hamlet exhibition. I’m surprised to learn that Hamlet is based on a legendary Prince of Denmark, called Amleth, who was likely a real person, although he predated the castle. The play’s plot and many of the main characters are woven loosely around the life of Amleth, which was recorded in texts available to Shakespeare. 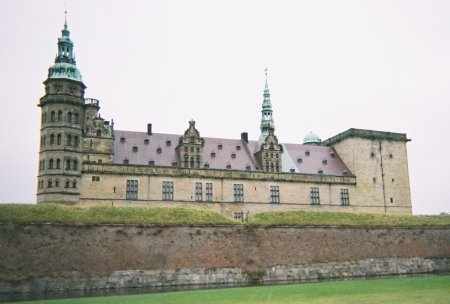 The playwright set his drama in Kronborg and had possibly visited the castle himself as a travelling player - or perhaps with his father, to trade. It seems certain that, at the very least, he worked in London with actors who had performed here. Helsingør itself has many half-timbered houses in old, narrow streets and was clearly a major trading port providing support services to the castle in Kronborg’s heyday. Today it is bustling with Saturday-shopping families and a sprinkling of tourists. Before resuming the train journey, we eat a hearty lunch in a crowded restaurant of tiny tables; ham and potatoes served by glowing girls in traditional costumes with red skirts and white aprons. Louisiana is Denmark’s national museum of modern art and is several train stops south in the village of Humlebaek on the Øresund’s western shore. We want to make this one further stop in Denmark, so reluctantly leave any further exploration of Helsingør. 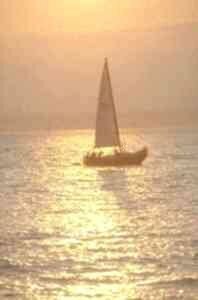 The sun is going down as we arrive, and we hurry to see the sculpture garden that descends to the shore. The cold wind continues to blow and few other visitors venture outside, but we can still see across the Sound to Sweden through the Henry Moore pieces. Inside this vast purpose-built gallery, the wide range of paintings and sculptures are displayed in spacious galleries and corridors where the glass walls provide a backdrop of trees, water and sky. Visitors cram into the well-stocked shop to buy prints and souvenirs before leaving . Again we don’t have time to see everything we’d like to; the gallery will soon be shut. I still don’t know why it’s called Louisiana. It’s dark by the time we get on the train to Copenhagen. On this visit to Denmark’s capital we see only the gleaming halls of the main station as we hurry through to find the train that will take us back across the sea. The spectacular Øresund Bridge links Denmark to Sweden and we can just about tell in the dark when the train is over the water. I remember the 16-kilometre long road and rail bridge is an awesome sight, having seen it on a previous visit a few years before when we made this sea crossing by ship. Its construction required the creation of an artificial island. The bridge was incomplete when I last saw it, and I vividly remember the gap in the middle as the train rushes relentlessly through the dark; thankfully, we regain land on the Swedish side, confirming its completion. There’s one last change of train in Malmö and we arrive back in Lund in time for a late dinner at our hotel. Next time we’ll take this fascinating trip at a more leisurely pace. If you enjoyed reading the above article then you will probably also enjoy the coastal border of Spain and France by Janet Laurie, and Oslo, also in Europe, and our latest articles covering the Orinoco Delta, La Mata, Marbella and Beijing.